Starting your college journey can be exciting, empowering, and… expensive. The good news for Ohio residents is that several federal and state resources exist to help you fund your future. In fact, Ohio sets aside specific financial aid packages for current and former Ohio residents. You are the workforce of the future, and Ohio recognizes that your education will not only benefit you, but the state that you live in. Ohio’s Forever Buckeye Program extends in-state tuition to all students who were Ohio residents at the time of high school graduation, regardless of current residency. The idea is “once a buckeye, always a buckeye,” and is part of an initiative to encourage young people to return to Ohio. How else can you receive financial assistance for college? Let’s discuss the four steps all Ohio residents should take to fund a college education. No matter what state you live in, applying for federal funding is your first step in paying for college. This can be done through submission of the FAFSA, which stands for the Free Application for Federal Student Aid. The FAFSA is a long form to fill out, so take a few deep breaths before you start. Don’t let the length deter you, however, or you could miss out on some great grant and scholarship opportunities. The earlier you complete the FAFSA, the better, as some scholarships and grants have application deadlines. Additionally, financial aid officers warn that some scholarships operate on a first-come first-serve basis, so your chances of receiving aid are higher the earlier you apply. It is always a good idea to seek out help if you have questions! Make sure to check out our handy guide to walk you through the process. The FAFSA will put you in the running for some state grants and scholarships, but Ohio’s Department of Higher Education has further resources that you may apply for, as well. Ohio College Opportunity Grant for students demonstrating the highest levels of financial aid (as dictated by the FAFSA) and enrolled at public or private Ohio colleges and universities. Apply through the FAFSA by October 1. Nurse Education Assistance Loan Program (NEALP) for students accepted to or enrolled in approved nurse education programs in Ohio colleges, universities, hospitals, or vocational schools. Choose Ohio First Scholarship is a scholarship for students pursuing a science, technology, engineering, mathematics, or medicine (STEMM) major at one of 49 participating Ohio institutions. Mckinney Family Fund Scholarship for Ohio residents of minority descent demonstrating financial need and sincerity towards their college education. Ohio Safety Officers College Memorial Fund for children and spouses of peace officers, such as fire fighters and other safety officers, who were killed while on duty in the United States. The award covers full tuition at public colleges and universities, and $8,115 per year at private and proprietary institutions. Ohio also provides information about how members of the armed forces can apply for aid here. Ohio Army National Guard Scholarship for members of the Ohio National Guard who are also pursuing a post-secondary education. This award covers full tuition at state universities or the equivalent amount at private institutions. College credit for military experience provided by all Ohio public colleges and universities. For more scholarships and grants, visit the Ohio Department of Higher Education, or contact your college’s financial aid office. Finding the funding you need may require you to do some searching on your own, as well. For current high school students, it can be helpful to meet with your high school guidance counselor to get information on local scholarships and to discuss your goals. Try setting a reminder on your phone so you don’t forget to schedule an appointment. And, while you have your phone out, it doesn’t hurt to look for additional resources online. The Cleveland Foundation lists over 60 scholarships for Ohio residents on their website, and OhioMeansJobs.com is a search engine where you can look up scholarships based on your zip code, GPA, and intended college/major. If you’re still in need of more aid, a private loan can help you make up the difference that you’ll need to fund your education. Before taking out any Ohio private student loan, check out our free NitroScore tool. 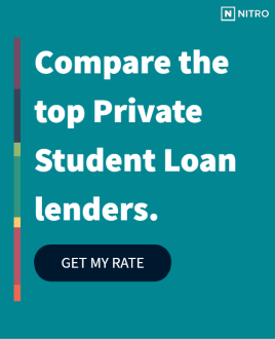 Simply enter a college and major to find out your total costs, salary after graduation, potential loans needed, and a score that tells you how easy those loans will be to repay based on projected salary. You can also customize the results with info about scholarships, grants and savings — and even compare different college/major combinations. From there, you can find out which of our trusted and highly vetted loan partners can give you the best rate. Ohio residents shouldn’t have to take on tuition costs alone. Start planning for your future today!